I wanted to highlight one change, that touches on a topic I mentioned in my first post on scalable Machine Learning. I discussed how, in my limited experience, a common workflow was to train on a small batch of data and predict for a much larger set of data. The training data easily fits in memory on a single machine, but the full dataset does not. A new meta-estimator, ParallelPostFit helps with this common case. It's a meta-estimator that wraps a regular scikit-learn estimator, similar to how GridSearchCV wraps an estimator. The .fit method is very simple; it just calls the underlying estimator's .fit method and copies over the learned attributes. This means ParalellPostFit is not suitable for training on large datasets. It is, however, perfect for post-fit tasks like .predict, or .transform. As an example, we'll fit a scikit-learn GradientBoostingClassifier on a small in-memory dataset. Nothing special so far. But now, let's suppose we had a "large" dataset for prediction. We'll use dask_ml.datasets.make_classification, but in practice you would read this from a file system or database. 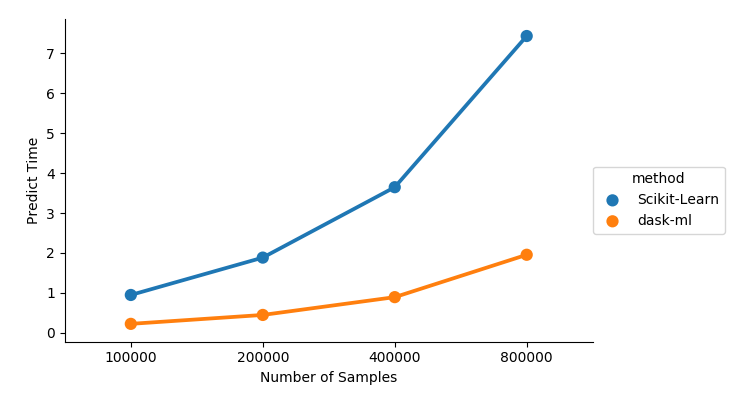 In this case we have a dataset with 100,000 samples split into blocks of 1,000. We can now predict for this large dataset. At that point the dask scheduler comes in and executes your compute in parallel, using all the cores of your laptop or workstation, or all the machines on your cluster. If you're able to depend on dask and dask-ml, consider giving ParallelPostFit a shot and let me know how it turns out. For estimators whose predict is relatively expensive and not already parallelized, ParallelPostFit can give a nice performance boost. Even if the underlying estimator's predict or tranform method is cheap or parallelized, ParallelPostFit does still help with distributed the work on all the machines in your cluster, or doing the operation out-of-core. Thanks to all the contributors who worked on this release.